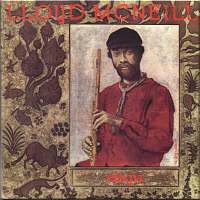 The first thing to know about Lloyd McNeill is that his are the very best soul-jazz flute LPs, and each is first-rate, a masterpiece of self-direction. The second thing to know is there is much more to him than his recorded legacy. He is one of those incredible, super-sensitive people who excels at every artistic idiom and endeavor; making wonderful music is just part of his flowing creativity. A professor (at Rutgers University, earlier Dartmouth), he has much to say about music and creativity as well as an impeccable gift for saying it...sensibly. McNeill's writings on his musical experiences provide invaluable documents of "the period" (late 1960s-1970s) as well as a rare glimpse at the joy of a relatively unsung master. Born in Washington, DC in 1935, McNeill earned his B.A. at Morehouse College in Atlanta and also studied painting at Howard University in his home town and lithography at the Ecole des Beaux Arts in Paris. 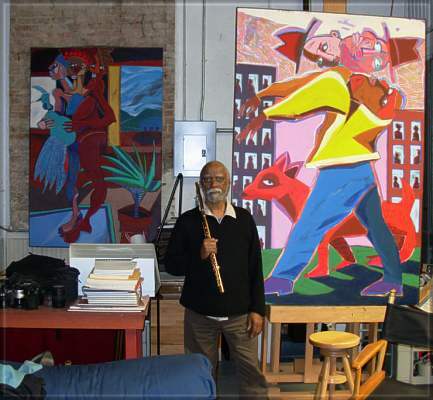 He has taught variously painting, illustration, and music at Dartmouth, Howard, Spelman, and Livingston College at Rutgers University. Films he has scored include "To Market, To Market," "TV Education in Samoa," and "Summer in the Parks." 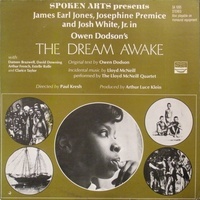 Also his quartet provided the music for the Spoken Arts LP "The Dream Awake." 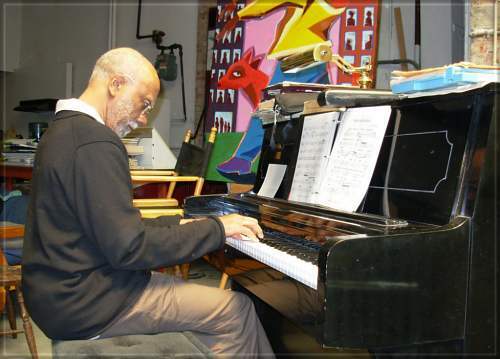 McNeill has played with jazz legends --Andrew White (his longtime collaborator/producer), Eric Dolphy, Sabu Martinez, Mulatu Astatke, among many others-- and he has had a significant hand in the arts scene of Washington, D.C. The major galleries of art, including those of the Smithsonian, sponsored multi-media "happenings" that soared far above the hippie caricature of acid rock with light show. During the first flowering of post-Civil Rights, African-American culture, the Lloyd McNeill Quartet's improvisitory, simultaneuous jazz and large-scale painting "happened" while a lucky, perhaps unsuspecting public drank it in. McNeill believes his influences and their results in his art, music, and poetry are inseparable and mutually reinforcing. Time spent with Picasso in Cannes, 1965 led to new expressions in all three, for instance. And when one brushes against a force such as Picasso, just the idea of "meeting Picasso" has a certain momentum, never mind the inevitable casting of rays of a different kind of light. Canvas, vinyl, the stage, paper, and books of poetry offer a few key imprints of McNeill, and McNeill consistently pays tribute to many illustrious peers. There are six principal albums, all produced and entirely under the artist's control. Each title surpasses anything comparable on the major labels, even Blue Note. 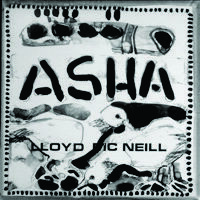 The Black Jazz label may be roughly similar in style, but Asha and Baobab are wholly Lloyd McNeill. The records reflect none of the usual external trends from the decade in which they were recorded; all sound like 1971 rather than 1979. The final record even reprises the first (the exotic, broodingly moody "Asha"), and the sound throughout remains somewhat interchangeable and timeless. But each record has its own themes and currents, and even improvisation has its signatures and fingerprints. Buying: Long out of print, collectors items, Lloyd McNeill records should be snapped up on sight. Hip Wax is pleased to offer the two titles for which limited stock remains as well as the Black Line book. 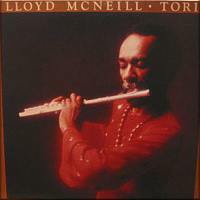 Other items, such as used originals of other titles and rare LPs featuring Lloyd McNeill, may be available. 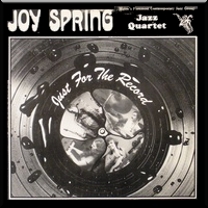 See the jazz page at Hip Wax for all items. First press in color jacket, second in b/w. A book of poems, photography, and drawings (pen & ink, brush & ink) by Lloyd McNeill. Also it provides brief biographical information and exhibit history current up to its publishing date of 1983. 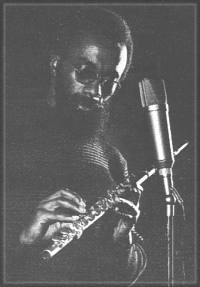 Like his records, Black Line is entirely self-produced (private press) by and under the direction of Lloyd McNeill. 64 pages. Single copies or wholesale distribution available.